All the trailers and ads for this movie proudly say “The new action film from Quentin Tarantino staring Brad Pitt,” but I gotta tell ya that that’s false advertising. Sorry about that. I was a little disappointed too. I guess this requires a little explanation. The “Brad Pitt” part is easy. “Basterds” has a running time of 2.5 hours and I would guess that Pitt is in it for about an hour of that but he makes every second of those scenes brutal and hilarious. But the absence of Pitt is not a bad thing since the other actors pull their own weight; it’s just not the Pitt-driven vehicle you probably thought it would be. With the exception of Eli Roth (Director of the “Hostel” movies), BJ Novak (“The Office”) and Mike Myers (yeah, that Mike Myers) you probably won’t recognize anyone in the movie. Tarantino selected a mostly European cast that is a virtual United Nations of languages. That’s something that you need to be prepared for since 75% of the movie is in subtitles as the actors speak German, French and even Italian. Two of the new foreign faces that are a joy to watch are Christoph Waltz and Melanie Laurent. Waltz is the perfect villain as he encompasses sinister humor and brutal menace in every scene he’s in. Laurent is a stunningly gorgeous French actress that has mastered the art of subtlety in her anguish and enragement so well, it’s devastating to watch. Now, what I meant by the lack of “Tarantino” is that the movie feels more like a European director trying to emulate his style. Maybe that was his point, but it backfires at times. It’s to be expected (and usually welcomed) that QT’s movies are self-indulgent, but when you have those long, plotting, dialogue-heavy scenes in another language it looses some of that Tarantino Touch that we all love and will sit through. The movie really does test your patience. The finale does NOT disappoint in the slightest, which is your reward for sitting through the whole movie. If you get bored or confused to the point of wanting to leave the theater, I would totally understand. All of his movies are made for true fans of film, but this may be his most ambitious attempt at seeing how far can he push his audience before giving them the violent finish they wait for. A lot of critics say that movies about the Iraq War aren’t very good and don’t do very well at the box office. I don’t entirely agree with that. I thought “Jarhead” and “The Kingdom” were two very well done Iraq War movies. But there’s something about “The Hurt Locker” that makes it not only the best Iraq War movie ever made, it might be possibly one of the best war movies ever made. But don’t go into this expecting the epic scale of “Saving Private Ryan.” Don’t expect the heartbreaking drama of “Platoon.” In fact, don’t even expect the sense of gallant pride that “Glory” delivered either. This movie is more in the realm of “Full Metal Jacket.” It’s not really about anything. It doesn’t have much of a story but it doesn’t need one. It’s written by Mark Boal who was embedded with explosive experts in Iraq. The portrait he paints of soldiers (he also wrote the very underrated “In the Valley of Elah”) is not heroic nor controversial. He knows that soldiers are complex and tortured people who have problems and dreams and fears but are trained not to let any of that surface. I think it has to be noted also that this movie was directed by Kathryn Bigelow…a woman. I think that’s significant because A: she proves that you don’t need to be a testosterone-filled man to tell a compelling war film and B: she may be the first female Best Director winner. She uses mostly handheld camera shots to create an amazing sense of tension and suspense. She also made the call to cast unfamiliar actors as the leads with a few famous faces throughout in cameos. Stars Jeremy Renner and Anthonie Mackie show us tormented and dark people who suppress their emotions so well, that it makes them a far cry from the John Wayne-type of heroes we’re used to seeing in war films. To describe what “The Hurt Locker” story is about is pointless. I think that’s why the title of the movie doesn’t even show up in any of the credits or is even spoken in any dialogue. 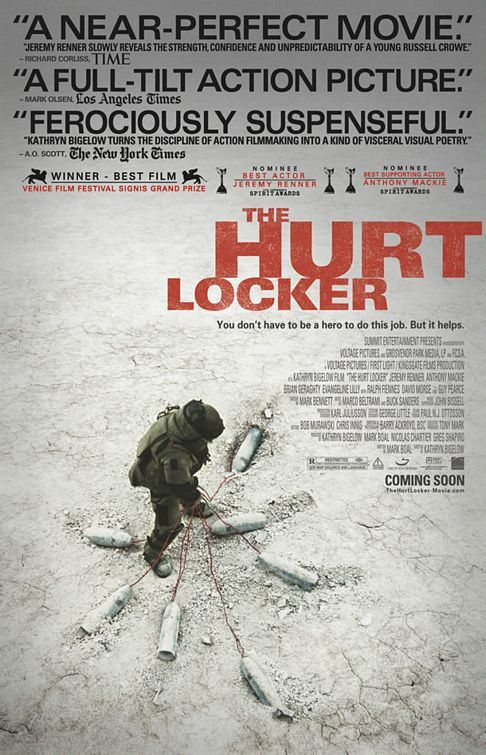 But a “hurt locker” is a military term for a figurative place where someone is expected to suffer great pain. Whether or not the “hurt locker” in this movie relates to Iraq or the mind of the soldiers is up to you to interrupt.